Well, from Jezebel we have a short article with a video showing performing cats from the t.v. show “America’s Got Talent”. But the talent here is mostly in the cats! This video shows that the moggies are a little reluctant at first, but then perform like troupers. I like the one who scuttles over the poles upside down, and jumps through the paper-filled hoop. From The Economist we have this provocatively titled article found by Matthew (click on screenshot to read it). It deals with pneumatic tubes, something still used in the drive-in-windows of my bank (there are three, and the outer two use tubes to carry checks, money, and so on. The article mentions how tubes were widely used in place of electronic transmissions in the nineteenth century, as they were actually faster. One of the most elaborate versions was built in New York, linking several post offices in Manhattan and Brooklyn. With tubes eight inches in diameter, it could handle small parcels. At its inauguration in 1897, a tortoise-shell cat was sent from the south end of Broadway to Park Row, nearly a mile uptown. The cat was dazed, but otherwise unharmed. Paris developed the most extensive network – it opened in 1879 and was capable of delivering a message anywhere in the city within two hours. Sending a “pneu” involved filling in a pre-paid form and handing it in at a post office, or posting it into a mailbox on the back of a tram. The missive would soon wing its way through the pneumatic-tube network to the post office nearest the recipient. Pneumatic tubes are still used to carry order slips in some libraries, to move cash out of tills in large shops, and to transport blood samples in hospitals. But improvements in communications technology, and the use of vehicles to carry mail, meant tubes were no longer needed to send messages. They had largely died out by the mid-20th century, though the Paris system remained in operation until 1984. This entry was written by whyevolutionistrue and posted on June 9, 2018 at 9:15 am and filed under Caturday felids. Bookmark the permalink. Follow any comments here with the RSS feed for this post. Both comments and trackbacks are currently closed. 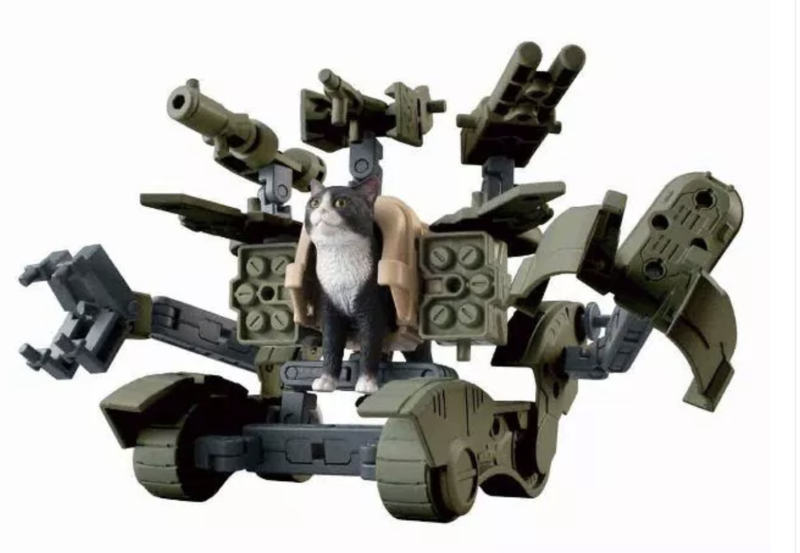 Nekobusou armored cats!! Just lack in the Book of revelation!! Pooor pneumatic kitty! I’ve always found those tubes in banks really cool. Didn’t department stores used to have them, too? Yes, they did. One paid the cashier who loaded cash and sales slip into a cartridge and sent it off, and a minute later your change and receipt would arrive back. 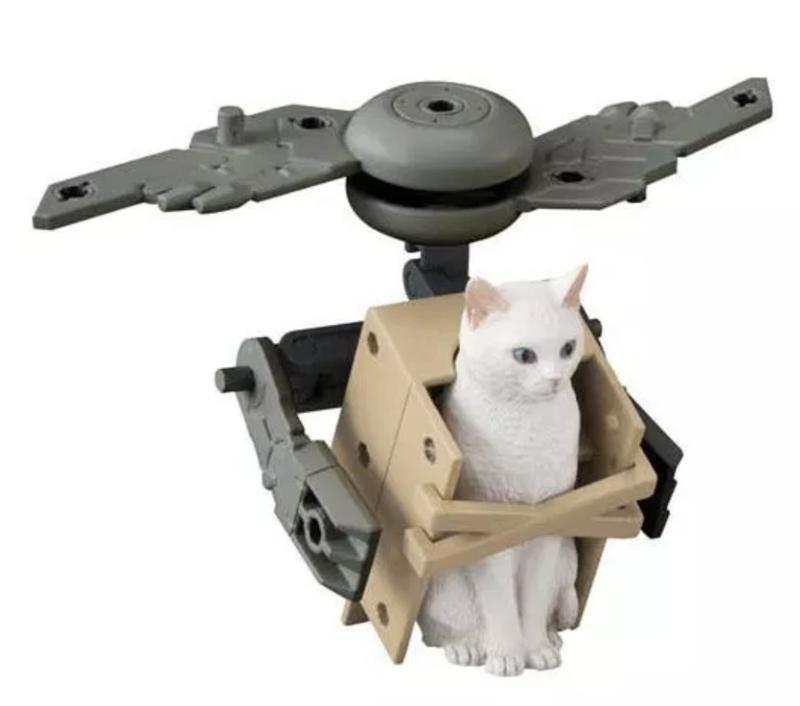 And some offices that only required items to travel horizontally had, IIRC, simply taut wires strung across the ceiling with carriers hung from them, one loaded the object into a carrier, pulled a lever and the carrier was ‘fired’ across the office on the wire. I’m sure I’ve seen this somewhere but I can’t find a reference to it. I remember them in department stores when I was a child. Ever the engineer, they really fascinated me. I particularly loved the sound they made when the cylinder arrived or departed. I am also watching the development of Hyperloop technology which reminds me of these old pneumatic tubes. Of course, they use different technologies. Pneumatic tubes aren’t evacuated like Hyperloop ones. And Hyperloop vehicles aren’t driven by air pressure. Tesco & Sainsburys still use them – the cash pods go to a timed safe. Saves security from having to walk the floor with cash at shift changes etc & I assume there’s insurance savings. Interesting! Timed safe? It can only be opened at certain times? Yes. To prevent an “open-that-safe-or-I-shoot-you” situation. Bad guy says “OK, we’ll wait”? You’ve escalated to hostage taking in effect. The police are on their way anyway & the Brit police dog is better trained than those kitties in that vile “[name your country]’s Got Talent” TV programme above – somewhat heavy on the Dunkin’ Donuts product placement too. More often the lock mechanism activates when you enter the correct combinations and have the correct keys in, but takes a half-hour (times adjustable) to open the safe, and fires off the alarm if it’s not closed within a certain time. So when the cash truck leaves the previous location, they phone you to give an ETA, and should arrive as the safe is opening. The pneu tubes would go into a cash room, but normally only contain larger notes – the small stuff staying at the till as “float”. So they’d be checked, credited to the till, and bundled up before being posted through the slot into the safe. Inside the safe is an empty cash carrier (with alarm, smoke and dye dispenser, direction-finder, battery etc…) which gradually gets filled through the slot. It’s contents will get checked again at the cash handling company. I had a friend in the cash handling business for a few years. I think some of those tubes actually used vacuum rather than air pressure. Very cool! With my luck I’d be sucked up into the ceiling. Shades of the _Willy Wonka & the Chocolate Factory_. 🤓If I got sucked into the (cooled) chocolate that would be fine by me. I was fascinated by pneumatic tubes as a kid. On the very rare occasions when I’d end up in a building with decommissioned tubes (I never saw them work beyond the disappointingly simple ones at the bank drive-thru), I would stand there and imagine what a little clear plastic case would look like whipping through the tubes and where it might be going. Of course, I almost never saw any tubes at all, as I was born well past the golden age of small tubes in walls that carry things in a very cool way. I wonder if the initial reluctance of the cat performers was part of the act. Just to build suspense. I did notice that many of those ‘tricks’ simply capitalized on what cats do habitually, such as (at one point) jumping into the tube (Maru?) or, when placed on (or hanging from) a bar, running along it. To me the most impressive part was when the two cats alternately jumped over each other. That really took training. Open a book and look at its writing. Now turn this book around and look at its reflection in the mirror. As expected, the writing in the reflection is now reversed from left to right (or from top to bottom, depending on how the book is flipped). Next take a pencil and hold it up so that the tip is to your right and the eraser to your left. Looking at this pencil from a mirror reflection, however, one sees that the pencil is not mirror reversed. There, the tip is also to your right and the eraser to your left. And yet the writing that shows the brand of the pencil is reversed in the mirror. When you hold the book up to the mirror, you have actually reversed the book physically. Suppose (instead of a book) the writing is on a thin sheet of translucent paper. Then not only do you see the writing reversed in the mirror, but you also see the writing reversed through the back of the sheet of paper. In the case of the pencil, you haven’t rotated it. You see the ‘front’ side of the pencil in front of your eyes and the ‘back’ side of the pencil in the mirror. If you treated the pencil like the book and rotated it end-for-end then the tip and the eraser would swap sides just like the writing in the book did. Side note: It’s much easier to read printing that’s been rotated 180 degrees (e.g. reading a page ‘upside down’) than it is to read text that’s been flipped left-right (as in reading the book in the mirror). I noticed this in an office where there were some notices taped to the windows with the light shining through them so the reversed text was visible. Your answer would gain admission, I expect. I saw it too, but it was fun to wonder about it for a moment. It niggled me, to the point of working it out. It took me a few minutes to see through the trick. Ever tried assembling type for a printing press? Now try doing it with the type line and characters upside-down. Much easier! That’s the same 180degree flip as you mention. I prefer to think of mirrors as flipping the “depth” axis, rather than flipping “left for right”. That came when I was trying to work out the chirality of quartz crystals as a teenager. For an example o ‘tubes in use see The Shadow movie. Pneumatic transfer systems are still used. I used to install them in large department stores, supermarkets and hospitals. “Hospitals?” I can hear you say? Yes. From the hospital pharmacy to the nurses’ stations on the various floors and wards. Other installers told me they had also installed them running from operating theatres to the pathology lab. There was also a pneumatic tube system beneath the streets of Melbourne which linked the office buildings of The Age, and The Herald Sun, the two major newspapers, at a distance of about two kilometers. That was over 45 years ago, and the tubes were brass. Perhaps those tubes are gone now. They would have been ideal conduits for fibre optics. Your friendly neighborhood translation man here. Also presenting the “tenkomori” set, containing all armament pieces in one box! 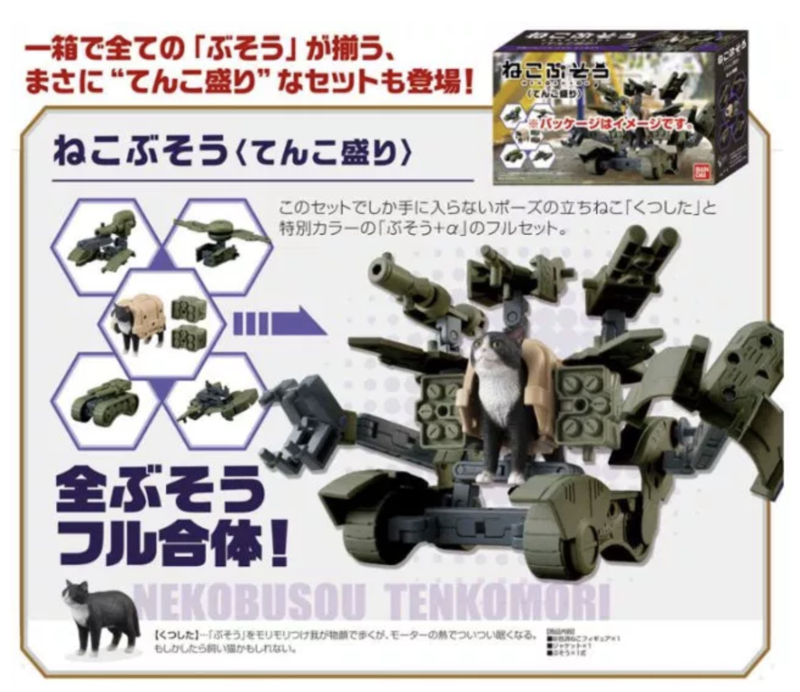 Full set includes specially colored pieces as well as “Kutsushita,” the only Nekobusou cat in a standing pose. The name of the cat, Kutsushita, means “socks.” The cat is named this because its feet are a different color than its body. One learns the most esoteric items here.